Take our Ham Trivia Quiz #2 in THE NIBBLE’s Gourmet Giveaway this week, and you may win a prize of an Easter ham. This is not just any ham, but our favorite ham from the ham artisans at Ham I Am, a NIBBLE Top Pick Of The Week (read the review). It’s 12 to 14 pounds and feeds up to 24 people (or provides ham sandwiches for the family for a week after Easter.) Just answer four fun trivia questions about ham—you don’t even have to answer them correctly. Everyone who enters has an equal chance of winning. Take the quiz, from March 10th through March 16th for the prize, or anytime for fun. You’ll learn the 411 about what makes a great ham, in the process. Learn more and enter. Read more about our favorite hams in the Pork, Ham & Bacon Section of THE NIBBLE online magazine. 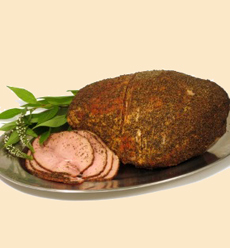 Win this 12- to 14-pound ham for Easter dinner. 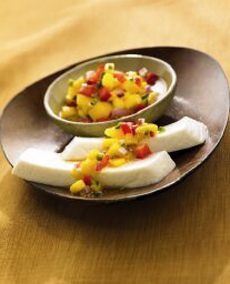 An appetizer of queso fresco cheese with hot mango salsa from Eat Wisconsin Cheese. Here’s the recipe. Half of the top 10 fastest-growing cheeses at retail are Hispanic-style cheeses. There are more than a dozen types of Hispanic cheeses available in the U.S. We took a giant nibble and ate them all. While some cheeses are imported, only cheeses aged 60 days or longer can enter the country; so the fresh cheeses used for cooking—queso blanco, queso fresco, queso para freir, panela and requeson—are made in the U.S.—in large numbers in California and Wisconsin. In addition to the Fresh Cheese category there are Melting Cheeses and Aged Cheeses. Here’s a tasty introduction to Mexican and Hispanic cheeses. Discover many more cheeses in the Cheese Section of THE NIBBLE webzine, and pull down this blog’s “Gourmet Food” menu at the right to and select “Cheeses” for even more. As part of a recent 2008 Flavor Trends luncheon, McComick & Company allowed us to taste the most menu, including frozen desserts prepared by artisan gelateria Il Laboratorio del Gelato. Rose Poppyseed Gelato was a revelation, making us wonder why no one has thought to do poppyseed ice cream before—don’t we all enjoy a good slice of lemon poppyseed cake? Here, the flavor of rose tasted almost peachlike, making us count the days to peach season so we can make Peach Poppyseed as well. Lychee Lemongrass Sorbetto was so exquisite, our tongue froze eating too much of it. Chile Chocolate Gelato, made with ancho chile, should take off big-time at better Mexican restaurants and homemade ice cream shops. We actually wrote this post a month ago, but haven’t had the heart to publish it because we are so tortured because there’s NO MORE GELATO. Thai Chile Chocolate is available from the store and website, but much as we love the spicy chocolate, we’ve been obsessing about the other two. Jon Snyder, when will you end our misery by putting them on the menu? 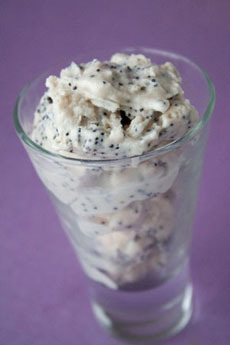 Rose and Poppyseed Gelato from Il Laboratorio del Gelato, inspired by McCormick’s 2008 flavor trends. Read more about our favorite ice creams in the Desserts Section of THE NIBBLE online magazine. The whitest, biggest chunks of crab—known as Jumbo Lump crabmeat—are also the priciest. How can you celebrate National Crabmeat Day and still have change to spare? Here’s the secret: Those pretty puffs of lump white crabmeat on the buffet are up to three times the price of the darker body crabmeat. But the darker meat is actually tastier. If you’re mixing the crab into a salad for sandwiches (think crab rolls, like lobster rolls, or serve it on brioche, as a crabmeat BLT) or to stuff eggs or omelet, save money—and enjoy crab more often—by using dark crabmeat. – Learning about the different types of crab and crabmeat, and what you should look for when you purchase canned crab. 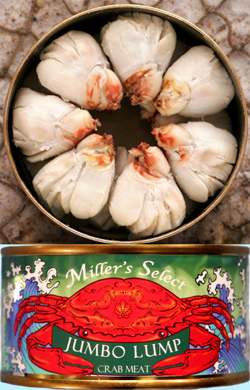 – Read our review of Miller’s Select, our favorite brand of crabmeat (it’s shelf-stable too, no refrigeration required). – Make one of these crabmeat recipes. – Buy this nifty little crab cookbook: Crab: Buying, Cooking, Cracking, by Andrea Froncillo and Jennifer Jeffrey. Does National Cereal Day sound like nothing to get worked up over…because you enjoy that bowl of Cheerios 365 days a year? Are you bummed that it isn’t National Bacon Cheeseburger Day or National Apple Pie À La Mode Day? Show a little love, please! 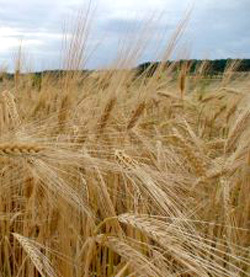 Cereals are wild grasses that were cultivated thousands of years ago. Their edible grains, or seeds, are staple crops throughout the world. A staple crop is one that is grown in greater quantities, and provides more energy calories, than other crops. In some developing nations, grain constitutes almost the entire diet. But, here’s a happier fact: Cereal takes its name from Ceres, the Roman goddess of harvest and agriculture. The Greek goddess equivalent is Demeter. Corn, wheat and rice account for 87% of cereals grown worldwide—wheat in temperate regions, rice in tropical regions, corn in the Americas and Africa. Barley for beer and other malted foods. In the U.S., more corn is grown to feed cattle than humans. Amber waves of grain. Note the grains, or seeds, at the top of the stalk. Edible kernels are inside the husks. The Breads Section of TheNibble.com. The Cereals Section of THE NIBBLE.com. All about whole grains in our article on Whole Grain Cereals.